Ivor Bolton’s Bruckner cycle, of which this is the seventh installment, has been a competent and occasionally absorbing affair, but never an exceptional one. 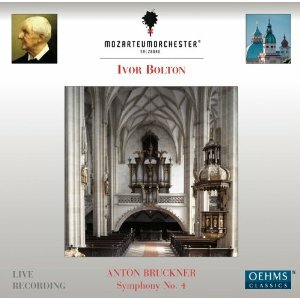 Bolton himself aspires to laudably old-fashioned values in his Bruckner: he’s looking for drama, weight, and gravitas. Sadly, these qualities are regularly undermined by a lack of coherency in his tempo choices, clumsy gear changes, and variable standards from his ensemble, the Salzburg Mozarteumorchester. Previous installments have occasionally given the impression that much of this was deliberate. The orchestra has a thin and often monotonous string sound, which, combined with its name, could suggest that the ensemble is small and is aspiring to classical or chamber qualities. But no, Bolton’s efforts to make this Fourth Symphony sound monumental demonstrate that none of this is intentional, and that he is trying—in vain sadly—to get the maximum color and character out of his players. The top of the string section isn’t too bad, and the violins are just about able to cut through the tuttis with their high tessitura tremolos. But when the melody moves to the cellos, all the life and energy goes from the tone. The winds are generally better, and the horn section is the only one that is able to make a lighter sound seem like a virtue; their nimble calls at the start of the third movement a rare redeeming feature. For the tuttis though, the horns need more weight, and on the regular occasions that Bruckner carefully balances them against the trumpets, the trumpets always dominate. Whatever the failings of Bolton’s approach, he can never be accused of running on autopilot. He uses some quite extreme rubato to shape the phrases, and also often makes a point of big downbeat entries by leaning on the upbeat. Holding a tenured position with a respected Austrian orchestra, he’s obliged to get the second movement Ländler right, and the rustic feel of these sections does come off well. But elsewhere his interventions are extreme to a fault. The second movement comes in at just over 15 minutes, which is not exceptional at all. But from the lack of any apparent underlying tempo in the opening phrases, it is easy to get the impression that the movement could be about to last twice that long. The lack of weight and impact is most apparent in the climax to the second movement and the coda of the finale. In both cases, Bolton suddenly puts the brakes on, presumably in order to move to a statelier tempo. But both times the music just grinds to a halt, and, even though the preparation for both climaxes is good, the tension is immediately lost. So, not really a contender then, although others may judge it less harshly than I. I’ll admit at this late stage to a certain prejudice against British conductors attempting Bruckner, as I’ve never experienced either a live performance or a recording of a Bruckner symphony under a British baton that was any better than barely competent. Bolton’s cycle seems unlikely to disrupt that pattern, which is a real shame, because, unlike most of his compatriots working in this repertoire, Bolton knows how this music should work and repeatedly attempts to point it in the right direction. That makes it even more frustrating that almost every interpretive decision here seems to either backfire or just fall flat.